Just How Do You "Comparison Shop"?Just How Do You "Comparison Shop"? Home › Credit Cards Blog › Just How Do You “Comparison Shop”? Just How Do You “Comparison Shop”? Credit cards are one of those financial products that we shouldn’t go into without understanding exactly what the rules are that we’ll be playing by. When we’re in the grocery store, it’s easy to hold two similar products in our hands and scan the nutritional value, the pricing, the difference in quantities, etc. But with credit cards – that, of course, isn’t an option. There is no “one size fits all”. There are, however, different levels of quality and value for our money. Before you begin looking at credit card offers, you owe it to yourself to make sure your credit report is up to par. Look at it this way: you wouldn’t go into the supermarket with no idea of how much money’s in the bank, right? It’s the same thing with shopping for the best credit cards: you don’t go into not knowing what you qualify for. By requesting a copy of your credit card, you can be sure there are no errors that are keeping your scores lower than they should be. Don’t assume that someone will eventually see and correct that double entry of an account. Whether you make payments on time or not, another open account – even if it’s an obvious duplicate – can affect your credit scores. The formulas used to come up with that three digit number doesn’t have any kind of mechanisms in place to recognize two exact mortgages with exact balances. Those formulas simply recognize there are two balances of $88,000. Same thing goes with medical bills that you don’t owe, credit card accounts that aren’t yours (and yes, it happens) and a host of other kinks that can play havoc with your overall credit history. If your credit report is lacking you’re not going to qualify for the lower APR credit cards. Get in there and get that peace of mind before you ever begin the credit card shopping process. So now you’ve scoured your credit reports (all three of them) to ensure they’re accurate. You know what they are and you know where you fall in terms of good versus excellent credit. You’ve already narrowed down the field of credit cards in terms of what you will qualify for. Let’s say your scores have taken a hit in recent years (thank you, recession) and while you’ve managed to pay all of your accounts, there were a couple of late payments on your car loan and mortgage. Your credit scores are 650, 680 and 681. You wouldn’t qualify for those credit cards that require excellent credit, but there are some great choices that your credit scores will garner an approval. We went to our Credit Cards Co site and chose three credit cards that require a “good” credit rating for the purposes of this column. 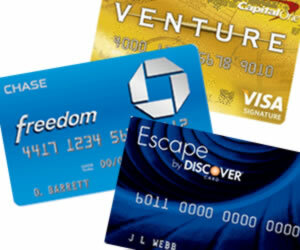 We chose the Chase Freedom Visa, Discover Escape and Bank One card. Let’s compare! We’ll earn 1.25 miles for every dollar we spend and we’ll also earn a one time bonus of 10,000 miles if we charge at least $1,000 during the first three months. We know, too, that we can redeem those miles on hotel rooms, car rentals and, of course airline tickets. We love the idea of a 0% APR on all of our purchases until August 2013 and we’ll never pay an annual fee nor will we pay foreign transaction fees. Our variable APR will fall between 11.90% and 19.90%. After we make $500 in purchases on our card in the first three months, we’ll earn a $100 bonus cash back. We’ll also enjoy a 0% APR for the first fifteen months – and that applies to both purchases and balance transfers. Chase also has bonus categories that rotate every three months, which can up 5% cash back on hotels, retailers and even restaurants. All of our purchases earn us 1% cash back. This card has no annual fee. Our third selection, the Escape by Discover offers its share of perks and benefits too. We’ll earn double miles on every dollar we spend, we’ll have an intro 0% APR for the first six months and we won’t be hindered by airline restrictions – we can use our travel rewards on any airline, any hotel or any car rental. Those points never expire. This credit card also offers travel insurance benefits, which is great for when we travel. There’s a $60 annual fee with the Escape by Discover. The $60 annual fee associated with the Escape by Discover is reasonable, but the other two have no annual fees. With both the Discover and teh One cards, we earn travel rewards. If you don’t travel, these two might not be the best choice for you. If you do, then you might want to narrow your choice to these two. The intro APR rates: we’ll have a 0% intro rate for fifteen months with the Chase card, six months with the Discover card and until August 2013 with the One card. The Chase offer has something the other two don’t have: bonus categories and the opportunity to shop through Chase for even bigger savings. There’s also a $100 incentive for choosing Chase. By now, your decision should be a bit clearer. And that’s how you comparison shop. Be sure to review the benefits – as we saw above, if you don’t travel often, the travel rewards aren’t going to benefit you as much as cash back would. By knowing what you’re looking for as you go into it (because you’ve reviewed your credit report), you’re better able to manage the many offers that are available today.